On the heals of a small trial project, GreenVolts scores Solar Project and Investment from Avista, GreenVolts has landed a deal with PG&E Corporation (NYSE:PCG) per PG&E Adds Utility-Scale Solar Projects to Its Power Mix or see GreenVolts to Deliver Wholesale Distributed Energy to Pacific Gas & Electric Company. GreenVolts’ concentrator technology makes the sun a realistic and economical source of renewable energy for utility companies and their customers. By emphasizing efficiency and flexibility, GreenVolts can rapidly deploy solar power plants that deliver more energy per dollar than conventional technology, but with a smaller footprint and that can be located anywhere along the grid – saving utilities more time and money. Construction of the 2MW GV1 solar plant for Pacific Gas & Electric will occur in two phases. GreenVolts will complete the first phase by the fall of 2008 and the second phase by the fall of 2009. 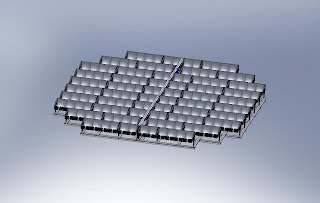 GreenVolts’ 3kW low profile CarouSol platform (see conceptual drawing) will be the primary building block of the solar plant. Congratulations are in order for Bob Cart and the GreenVolts team and progressive partner PG&E. This is a milestone for High Concentration PhotoVoltaics in the United States. Doesn’t it just figure this would happen first in California!